Man, this is one serious movie. And I never expected it when I bought this DVD. I thought it’s a light and fluffy about friends bonding together and pursuing their dreams. Yes, it is a story about 4 friends, all aspiring artists and have dreams of succeeding in their craft. The four are Eisuke (the manga artist), Ryuzo (the novelist), Shoichi (the singer/songwriter), and Kei (the oil painter). This group believes that if only they can really focus on their art without worrying about other aspects of life (i.e. money, food, rent), they’ll achieve their goal and gain the freedom in “doing what you please, as you please”. Thus, starts their summer journey where they learn the facts of life. What made this movie special is the message it wants to impart is so real and true. I may be a cynic speaking but, although you may have dreams of what you want your life to be, life may have different plans for you. You may want to live life doing what you want and not take day jobs, but reality is, you’d have to eat, pay rent.. survive. The movie is actually not a deep drama where you cry. It doesn’t have any complex themes. It’s like a subdued narration of life. So somehow, it makes you think about your own life story after watching it. 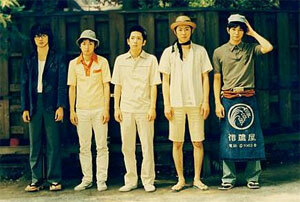 Acting-wise, again, the characters are played by all 5 of the arashi members. Eisuke is played by Ninomiya. He’s starting to get my attention with his acting. He’s good at portraying Eisuke, the idealistic manga artist, with a dying mother and 3 tag-alongs to care for. Sakurai Sho’s delivery is a vast improvement from the Yamada Taro series and he’s actually quite believable as a bum novelist. Actually, the other two are quite good as well (Ohno – the painter, Aiba – the singer). Jun Matsumoto is more of just an extra in the movie, and I found his delivery more on the over-eager side (or it could be, that was how the character is supposed to be). Overall, I’m quite impressed. The atmosphere set by the film is also something to take notice of. Some may find it dull, with the lack of flashy scenes and complicated sets, but it blends well with the story. It’s a simple, quiet film. And in it’s silence, it somehow makes the sadness of story resonate more. This movie is also a goldmine of quotable quotes. I’d have to jot a few of them down here. “starving is part of being an artist. It adds to the experience.” – Ryuzo. Words of a bum. “no point in being lonely together. Isn’t it easier to be lonely alone?” – Tokei. Hmm.. Come to think of it, yes, she’s got a point there. “how ironic that our season of doing what we please has caused us to abandon just that.” – Kei. That reflection is kinda bittersweet. The end of the summer is like a coming of age to them. Reality has set in. Life never deceives man. Life… has never deceived man” – Kei, quoting a French poet, Ryuzo. It’s quite deep. No matter how many times I read these lines, I come up with new reflection on it. Yep, life has never deceived man.